The purpose of our engagement management and product development framework is to define a series of activities and considerations that assist in the development and delivery of our service offerings ─while providing a process for gathering and sharing of best practices. The following is a high-level approach for the delivery of our Technology Implementation solutions. 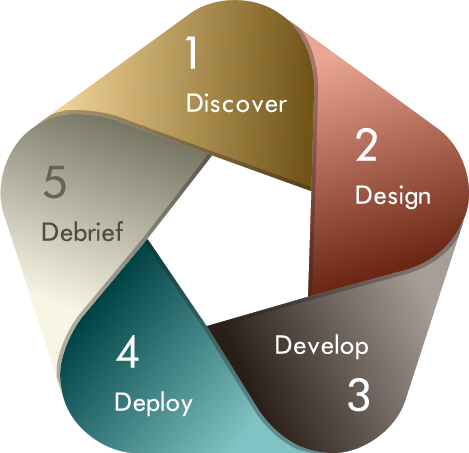 We deploy a standard project management methodology made up of common Discover, Design, Develop, Deploy and Debrief technology implementation lifecycle steps. The Discovery phase consists of the research, feasibility and data-gathering elements. The results will later be analyzed to insure alignment with the client’s needs. This phase enables clients to better understand how their business can accelerate by leveraging technology to build efficiencies, drive revenue and lower costs. The Design phase focuses on producing a strategic point-of-arrival architecture for the implementation of technology support requirements. In addition to proposing a targeted architecture, we will clarify, validate and approve a joint understanding and recommendation of the solution implementation approach. This Development phase builds upon the discoveries of the previous phase, People, Process and Technology architecture is designed, diagrammed and approved. Each mission-critical technical requirement is moved by client approval: with fully documented and rigorous integration testing ─ensuring functionality, stability and performance. In the Deployment phase we begin the implementation and delivery of methodologies created in the project’s Design phase. Supporting products are monitored and reviewed allowing modification where inefficiencies are found ─each documented, tracked and rectified as they occur. Favorable results and client acceptance set agreed deliverables into motion. Deliverables are reviewed and approved recieving any final modifications as the solution is deployed into production with supporting materials and documentation. During the Debrief phase functionality and performance testing are finalized; fundamental measurement criteria are established and client validation is completed. Returning to the Discovery phase, we evaluate results versus benchmarks, determine the project’s success and make adjustments if necessary. All deliverables and documentation are delivered to the client and the project is complete!